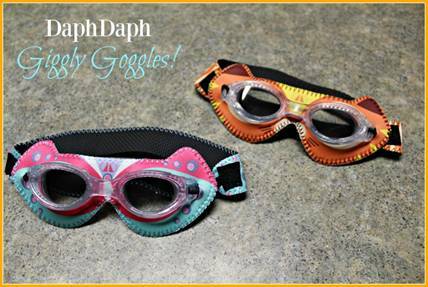 Let your child’s superhero alter ego enjoy Giggly Goggles, the chic and functional swim goggles by DaphDaph. Your child will be ready to take on all of the new and exciting adventures this year holds for them when they put Giggly Goggles on. With 11 different styles, your kid can go from being a robot to a princess to a tiger within seconds. These goggles are bound to become your child’s favorite new accessory! 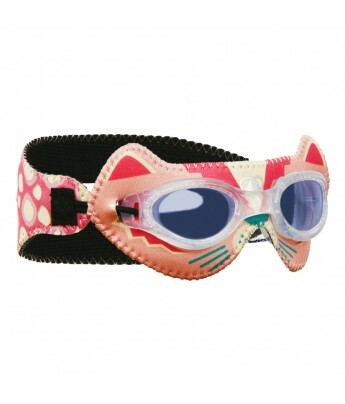 With a special bungee band on the side, your child can put these goggles on themselves without the need for adjustments. These comfortable Neoprene masks won’t hurt the bridge of your kid’s nose nor pull their hair either. Plus, there is a split ponytail portal in the back providing the most comfort for your little superwoman! Personalize the goggles by adding your child’s name or superhero name to the back, and avoid forgetting or losing them in a unique, fun and smart way! Giggly Goggles come in two sizes, munchkin and junior, and fit most children from infants to pre-teens. They also provide face and eye UV protection, and are made with top quality fog free lenses. Along with being fun and stylish, Giggly Goggles are also very affordable. At $25, you won’t break the bank turning your child into a superhero! Designed by mother of two, Daphne Kaufer, Giggly Goggles were created to help encourage kids to think and express themselves freely, thus creating their own identity. Top quality fog free lenses, face and eye UV protection, 100% Phthalates free. Kids can put these goggles on by themselves with no need for any adjustments. Don’t pull your hair or hurt the nose bridge. Just put on a smile : ) Fun, colorful designs to make your kid stand out in the pool. Safe for kids and the environment. Can be personalized with names or company logos. Easy care: gently hand wash with fresh water; after each use allow to air-dry completely. These cool looking Neoprene masks are sure to put a smile on every face and allow the kids to go undercover, underwater. Made from soft Neoprene on the outside and textured rubber on the inside for ultimate comfort, great traction and great hold! Unique patented design, no need for adjustments! Smooth glide and easy for kids to put on by themselves! The special bungee band on the side makes for an easy fit for most sizes! Split ponytail portal on the back allows for a perfect comfy fit! Come in two different sizes. Munchkin Goggles fit most toddlers 6 months to 2 years. Junior Goggles fit most children 2 years and up. Young fits most teens to young adults. Fit will vary by child depending on head size. Debating which size to take? We recommend ordering your child’s goggles a size up. Give your kid the self-confidence to handle whatever this vacation throws at them with Giggly Goggles by DaphDaph!